Pin It The options are endless on this wall hanging. The wall hanging center finishes at 24 x 24" and the borders add another 2" for a total wall hanging sized around 26" x 26" The color changes can make it versatile enough for Christmas, Valentines, Weddings, Nurseries, etc.. All that is needed is your creativity. I've provided links to various sites that publish "Storm at Sea" pattern instructions since this is what this quilt is. The only difference is the color placement I did. I'm sure there is someone out there that has done the same but I have not come across any. This quilt is AccuQuilt Go and Go Baby friendly or can be cut out of fabric using the EQ7 Rotary Cutting Instructions. Finally, there is an EQ7 Link provided since I created this layout using EQ7. You can download it from MediaFire below. ** Please note, the instructions are for a full Storm at Sea Quilt. But, it shows you how to assemble the 3 blocks above. You only need to complete the blocks in the full wall hanging image above. If this is too confusing, please feel free to contact me. I use mediafire.com for my downloads. Below is a link to the EQ7 file. 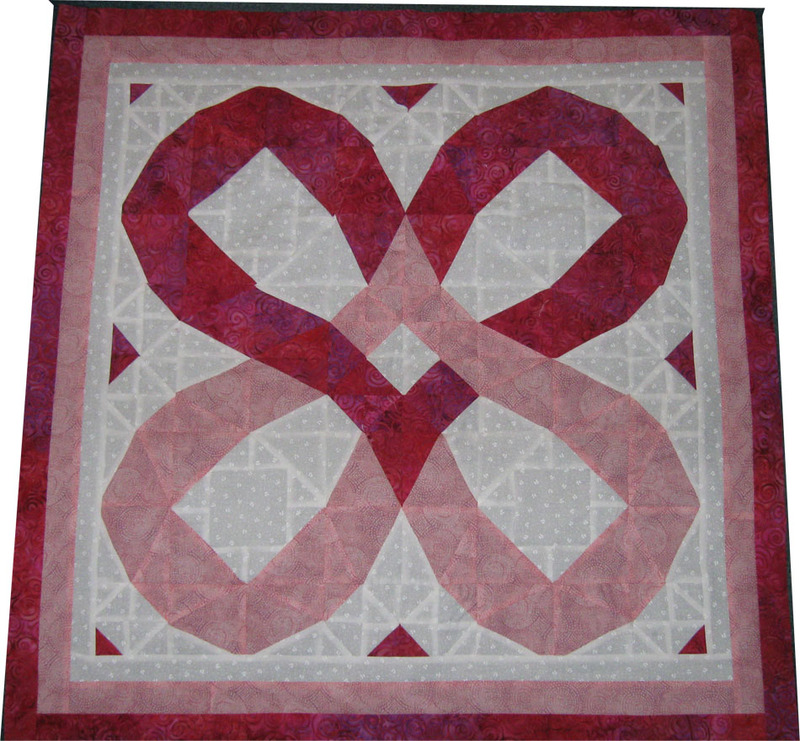 The file will assist to create the quilt if you need to rotary cut the pieces instead of using your AccuQuilt Go. Or, you will have your own quilt to try different color choices. My 3 borders used were cut at 1" wide white fabric, 1.5" wide pink fabric, and 1" wide red fabric. The length of the strips is usually around 26" to cover the 24" square center. However, I like to have mine longer and then I cut off the excess. In some of the areas, 4 Finished 1/2 square triangles come together in the same color. I would think I should be able to replace these with 2.5" squares instead. 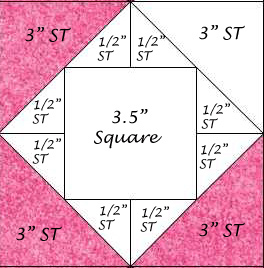 Next time, I may embroider a design on the 3.5" squares first, then cut them out and add to the quilt. It would be easier than thinking about adding after the top is assembled. Make sure you have enough Triangles in Square pieces cut going in both directions. I found that I needed to go back to cutting to get more of a certain direction. Don't be a perfectionist. If you have a pucker or bump, leave it in. It only adds character. I can see about 3 or 4 areas where mine don't match up. Most of all, have fun. Be sure to contact me with any questions and I'll help where I can! I don't always like hearts, but this is beautiful. Thank you for sharing. MediaFile is corrupt when I try to download as a PDF and it will not open. The file is not able to be downloaded in PDF format. It is an Electric Quilt 7 file type. Sorry, If you would like, you can print out the image above.